With hype around the 2015 Jeep Renegade maxing out, Kia reckons it can come play with its own spin on the micro "off-roader" idea. The Kia Trail'ster concept has meaty cladding, a roll-back softtop, and a drivetrain that makes it a very interesting proposition, especially if you value efficiency over dirt driving. The "e-AWD" powertrain is a turbo 1.6 gas engine driving the front wheels, burping out 185 horsepower and 185 lb-ft of torque. As predicted, an electric motor making 35 horsepower and 100 lb-ft of torque moves the rear axle as a supplement. That rear axle comes online when extra traction is needed, or more oomph for hard acceleration. An "energy recovery system" charges the vehicle and lets it run in full-electric mode at low speed, giving the Trail'ster "potentially 30% better fuel economy than a current Soul." Kia's Executive VP of sales and marketing Michael Sprague explains "the original idea for the Soul was born at our California design studio nearly a year ago," and basically they've never stopped messing with it. 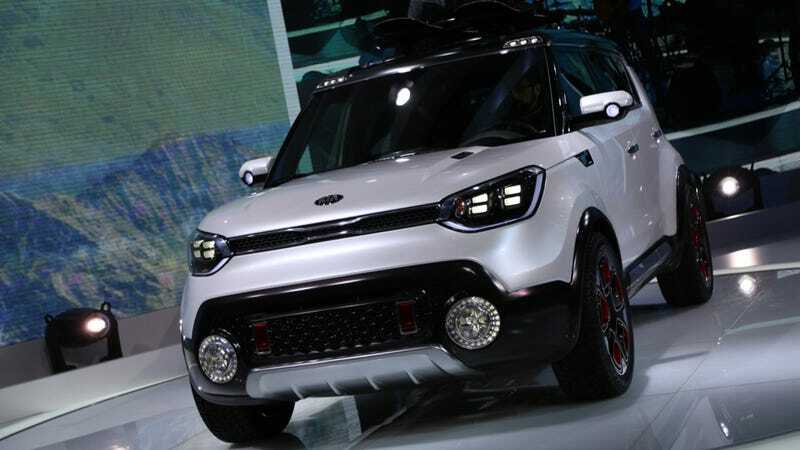 More significantly, he mentioned the Kia Soul EV's availability "would be expanding across the US in 2015." Production possibilities for the Trail'ster? "It's near-term look at how the Soul could easily evolve." So... maybe? (Probably not).